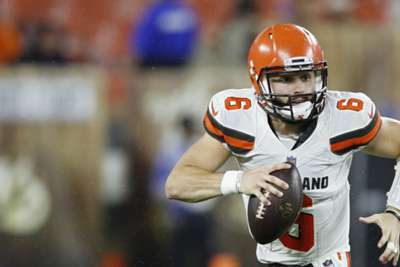 There is a little love affair brewing between New Orleans Saints quarterback Drew Brees and Cleveland Browns rookie Baker Mayfield. Brees said Mayfield, the number one overall pick in this year's NFL Draft, could be better than him. Brees said Mayfield was more mobile and had a stronger arm. "Yeah, it doesn't get much higher than that,'' Mayfield said Thursday, via cleveland.com. "That's one of the greatest to play of all time. That's the guy that I've had an unbelievable amount of respect for and looked up to just because of where I'm from first and then size and story as well. So I've always enjoyed watching him." Tyrod Taylor beat Mayfield out for the starting quarterback job, and he helped the Browns draw with the Pittsburgh Steelers in Cleveland on Sunday. While Mayfield was honoured by Brees' praise he understood he still has a long way to go. "It's really cool. It's humbling, but unless I go to work every day, then it's not going to matter,'' he said. "Expectations are one thing, but you've got to do your own, got to do your own."